Meet Leslie. She is 45-years-old. We can all agree that at this age, she looks amazing! Her skin is more clear, face is balanced and lifted, the jaw/chin line is tighter, her lines are erased and she looks completely natural! You’re welcome, Leslie! Leslie can be thankful for the following. The first is the innovation itself of superior products and treatments from 15 years ago. The second is, of course, her providers, Loraine Olson, RN, and Shae Ryan, licensed aesthetician. They are the Delaware Duo for Rejuvenation! On one hand, you have Loraine Olson who is an expert injector that trains other health care professionals like doctors, PAs and nurses the delicate art of injections for dermal filler and Dysport. On the other hand, you have Shae Ryan, who works magic with lasers, peels and skin care management. 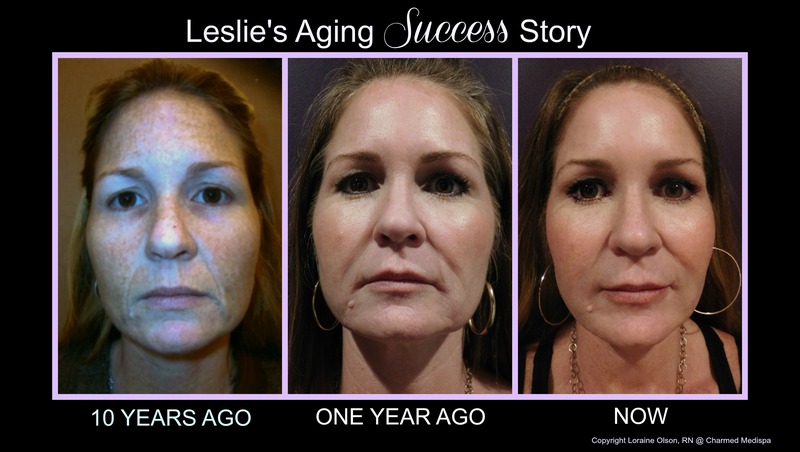 With both approaches to the face, you will find successful aging at its best! You get it from within the skin and from outside the skin topically. There is much success to be had for almost every concern you can imagine. The goal is to make sure the plan of action is appropriate and that the plan is executed by our experts. Leslie has no regrets and you won’t either! Charmed Medispa serves the tri-state area including Delaware, Maryland and Pennsylvania and offers medical grade skin care and treatments in a setting that is stunning. Complimentary consults are here waiting for you!